AN OUT-OF-FOCUS SNAPSHOT OF A BLONDE-HAIRED THREE YEAR OLD GIRL from Warrington dominated national media reports in the earlier part of last week. Charlotte Jones, of Lewis Avenue in the town's northern suburb of Dallam, disappeared around 5.15 on Monday afternoon. Soon a massive search was underway - police teams combed nearby fields and waterways, and the general public helped too. As each hour went by the police expressed "increasing concern for her safety". The whole country watched and waited, fearing the worst. But while all this was going on, Charlotte was very much alive, though in some distress and discomfort. Alone, cold, wet, tearful and scared, she sat in a bramble patch in scrubland near Burtonwood, five miles north west of her home, unaware of the national media attention she was attracting. At around 9.45 on Tuesday night, two officers found her, and radioed the good news. Someone had given the police information about her location. Soon Charlotte was taken to Warrington General Hospital and was found to be in good condition, considering her ordeal. Well-wishers sent cards and presents - Later, PC Janet Critchley told a news conference about the moment she and her colleague had found Charlotte: It was the happiest moment of her career, she said. A photograph, taken on a cheap digital camera was issued by the police - news camcorders weren't allowed anywhere near the 3 year old. The image was fuzzy and pixellated, but it showed a smiling Charlotte with a Tellytubby gift, and that was all we needed to know. It was a happy ending to a bizarre story. Like Hansel and Gretel, she had been left in the woods, but by whom? Police suspicions were evident even before the child was found. A car parked near the house was taken for forensic tests. Later it transpired that someone was "helping the police with their enquiries" - but they wouldn't say who. Pretty soon that person was revealed as Charlotte's mother, 24 year old Michelle Jones, and by the end of the week, she had been charged with child abandonment. Charlotte will now remain in the care of Warrington social services, deprived of a loving mother's care, but lucky to be alive. THE CHART LISTING REGION'S TOP 300 COMPANIES, as published in Tuesday's MEN, in association with Price Waterhouse Coopers, makes interesting reading. The top 3 have a turnover of around 3 billion pounds each(that's 3 with 9 zeros after it!). At number 3 are glass-makers Pilkington, based in St Helens; number two: The Co-Op Wholesale Society, who are based in Manchester, and at number one, with turnover of £3,362,700,000: Great Universal Stores plc. And I have a personal connection with them - my mother worked at their Ardwick offices for many years. NUMBER 2O IN THE LISTING IS GRANADA, and in the new year, they'll be producing a new weekly current affairs programme, presented by veteran newsmen Trevor McDonald and Martin Bashir, who interviewed Princess Diana. As revealed by Carl Palmer in the MEN's Diary, Trevor hopes he will be broadcasting from Manchester as well as London, though plans are only at an early stage yet*. The programme will occupy the slot vacated by the News At Ten when it finishes its 30 year run shortly. ITN's new 11pm report, to be presented by Dermot Murnaghan - who I noticed at the 18 June Louise Woodward press conference at Manchester Airport will be called the "Nightly News" and the early-evening programme will be called the "Evening News". Steve Penk of Manchester radio station Key 103 will have his own ITV show next year, and this evening, top Manchester chef Paul Heathcote appeared on BBC2's Food and Drink. I've also been told that Steve Coogan will be making a guest appearance as a vicar in Caroline Aherne's new Heaton Norris-set sitcom for 99 - "Mrs Merton and Malcolm". Oh, and one other thing, Coronation St heart throb Adam Rickitt, who I saw walking along John Dalton St a few weeks ago, is to leave "The Street" to pursue a pop career. FOOTBALL TV IS BIG BUSINESS - MUTV is a prime example, and so are football websites. A local web design company WSP, based in Chapel St, will be taking over Blackburn Rovers' website in a high-profile deal. The URL is www.rovers.co.uk. Manchester internet consultancy Happy as Larry have put together the Kino Film Club website, www.kinofilm.org.uk, where you can book tickets for the Manchester underground festival, as reported by David Gordon in the MEN's Infotec. And a new issue of Manchester Web-zine The Net Curtain www.thenetcurtain.com has rolled off the digital press, with features about the Royale Family and Fortean Times. You can also check out three Manchester watering holes - The Mark Addy, Dukes 92 and Jackson's Wharf on the Internet pub guide www.city2000.com. ON WEDNESDAY MANCHESTER UNITED CLASHED WITH BARCELONA and the result was 3-3. Back home, the club are going to expand the capacity of the ground, making it the biggest in the country. Local residents will be given help to cope with the extra crowds. United will also be featuring in a �10m film about the life of George Best. Jerome Flynn will play Sir Bobby Charlton - other parts include: Tim Roth as Dennis Law, Patsy Kensit as Best's wife Angie, John Lynch as the younger George Best, and George Best playing himself at the end. And match days may become alcohol-free in Manchester if the proposal is approved by the Home Secretary. Sale of alcohol in the vicinity of the ground will be prohibited - I wonder how wide the radius will be. THE SHOPPING WARS HAVE BEEN HOTTING UP as Christmas draws ever closer - I've been keeping out of the fray myself, but Ann tells me it's a mad scramble. Yesterday I was in town, but didn't venture down Market St. 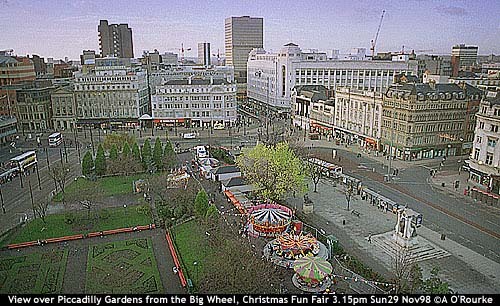 Instead, I went up on the big wheel in Piccadilly Gardens to get this and three other shots. Browse 644 through 647 in the Image Collection. THE VIRGIN TRAINS AD QUOTES 3 REASONS FOR TRAVELLING BY TRAIN - the M1, the M5 and the M6. And in the early hours of Saturday there was a horrific pile-up on the M6 south of Sandbach, in Cheshire, in which three people were killed. On November the 18th there was an accident not far from there, on the northbound carriageway, which caused huge disruption. A 15 YEAR OLD BOY WAS ARRESTED ON FRIDAY by police investigating the motorway brick attack on Cathie Hall, from Crosby. Police have expressed gratitude to the public for their help in the inquiry. "I'D RATHER BE GAY THAN BLACK": These words, uttered by Deputy Greater Manchester County Fire Officer Don Bramhall, have provoked a storm of controversy over the past week. He hasn't denied that this is what he said, but maintains the words were taken "totally out of context". There was an inquiry, he was suspended on Thursday and he'll now face a disciplinary hearing, and could be demoted or sacked. The question of racism in Greater Manchester's police force and fire service continues to be debated. Other cases of unguarded remarks by people in important jobs included Gordon Towell, executive with Granada who allegedly said he wouldn't employ fat people, and a professor at Manchester University who complained that there were too many overseas students. BARRY DALY, NICKNAMED THE "FAT CONTROLLER", WHO SOLD RAILWAY STOCK without the authority to do so was given a 27 month jail sentence, though he won't have to serve all of it. He is reported to be ashamed and embarassed, especially with the media attention. He has put his house up for sale to repay the debts. One of the people duped by Daly is wealthy record producer Pete Waterman, who runs a trust which renovates old trains. THE FIRST FIVE STAR HOTEL IN GREATER MANCHESTER is coming soon, and it will be built on the Salford side of the River Irwell, next to the new Inland Revenue building, not far from the Calatrava Bridge. It's part of the Chapel St regeneration scheme, with also includes the refurbished Chester's Brewery, alias the Deva Centre. THE EXCHANGE THEATRE RE-OPENED TONIGHT, with the play "Hindle Wakes" whose run was violently disrupted in June 1996 by the IRA bomb. More than two years later, cast members and audience have had an emotional evening in a much improved theatre. But elsewhere in Greater Manchester, other theatres face an uncertain future - the magnificent Art Deco building on Washway Rd, Sale, formerly the Pyramid Theatre, now Liberty's Bar, is in need of urgent repair work. It's a listed building, so owners European Leisure have had to apply for permission to alter it. 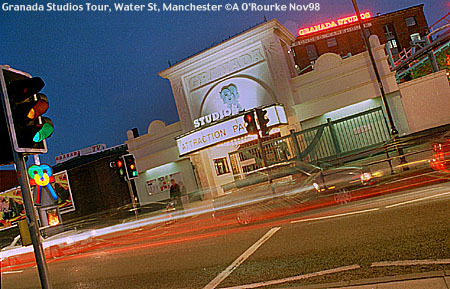 And across in Didsbury, the Capitol Theatre may well be demolished to make way for new flats. I remember the talent show Opportunity Knocks, starring Hughie Green, being broadcast from there in the 1960's. CONCERTS IN MANCHESTER THIS WEEK INCLUDED THE GUARNIERI, Prague, playing Czech music at the Royal Northern College of Music, the Glyndebourne Touring Opera at the Palace Theatre, Bjork at the Apollo, M People played in Dublin last Monday, and will be at the MEN Arena on December 17, 18 and 19. Meatloaf will be appearing there on April 8, and Dubliners Boyzone will be at the MEN Arena On Friday May 21 of next year. Elton John performed at the MEN Arena on Friday night. He was joined by ex-Take That singer Gary Barlow. Lionel Richie was there on Saturday night. The Classic Car show took place at GMEX yesterday - concurrent with the Holsten Bier Fest, running from Monday 16 Nov to Sunday 6 December. IT'S DAMP AND COLD, BUT NOT FREEZING IN MANCHESTER at the moment - yesterday was sunny, but today had a misty, wintery feel with some hazy sunshine. The current EWM temperature is 7/45 degrees. I think I'm coming down with another bout of winter flu symptoms, so I'll sign off now. 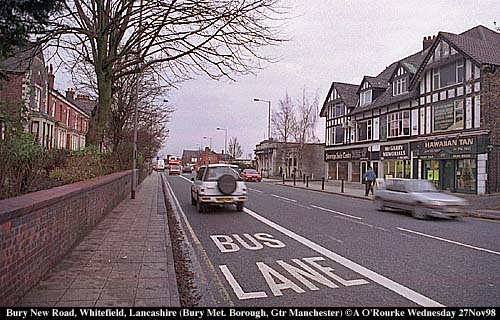 Here's a view of Whitefield - looking a bit dull and cloudy. See also the picture of All Saints Church., in nearby Stand.